I am frequently surprised by how many people do not understand copyright, fair use, and public domain. This lack of understanding is not good; among other things, it means that those who do understand copyright (i.e., those who can afford to pay scads of lawyers to understand it for them) can drive legislation, policies, and court decisions favorable to their interests. By and large, regular consumers and independent/small producers are at a disadvantage. Note that the person quoted in the article is a musician, whose livelihood probably depends heavily on the creation, monetization, and protection of intellectual property. When he says “public domain”, he probably truly means “fair use”; when he means “fair use”, he probably truly means “fair play” — that is, while legally shady, releasing these documents is morally square. We have to stick it to big corporations, right? Right? At least, that is what I read into a statement that is otherwise fairly nonsensical. Compendium of U.S. Copyright Office Practices, Third Edition. There is a lot that Sony and I would probably disagree about in any copyright/fair-use conversation, but I think we are on the same page here — stolen correspondence that has been dumped on the Web is about as far from public domain as it gets. When people do not understand this and abuse terminology in defense of arguably immoral and probably illegal behavior, limitations on copyright terms, protections for fair use, and expansion of the public domain potentially suffer. After yesterday’s post highlighting Jörg Lohrer’s riff on an old anti-copyright infringement slogan, I was inspired to make my own version of the ‘X is killing Y and it’s illegal’ thing. The original is here. Lohrer’s and mine are below. 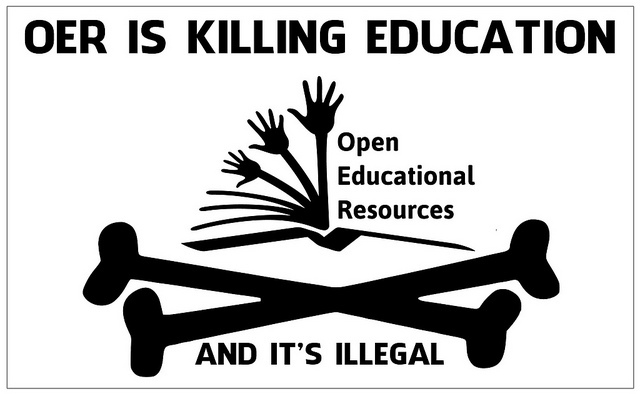 “Open Access is killing publishing” incorporates the image “Open Access logo” (PLoS – CC0) and is based on “OER is killing education” by Jörg Lohrer, which incorporates the image Open Education Resources Logo (Jonathas Mello – CC BY 3.0) and is inspired by the Home Taping Is Killing Music campaign and the tradition of parody derivatives. Naturally, I was curious. The Flickr page offers little to go on at first blush. Is this just for some light trolling? What sort of reaction is it meant to provoke, and from whom? To satisfy my curiosity, I dug a bit deeper, and to pay it forward (or spoil the surpise, depending on how you look at it), I share below the fruits of my research. Lohrer credits the OER Logo and the Home Taping Is Killing Music campaign. The former is ubiquitous in OER circles, of course, and the latter has apparently been widely parodied (and is twice referenced via Roy in The IT Crowd, which I certainly approve of). So…parody…which, of course, is clear from the picture to begin with. Threats to OER tend to be a bit more subtle. Overall, I expect this image is intended to critique (often hollow) arguments against the Open movement, both from (some) individual producers jealous of their IP rights and from (some) publishers who view themselves as necessarily the best arbiters of quality. Fair Use Is Killing Copyright…And It’s Illegal! 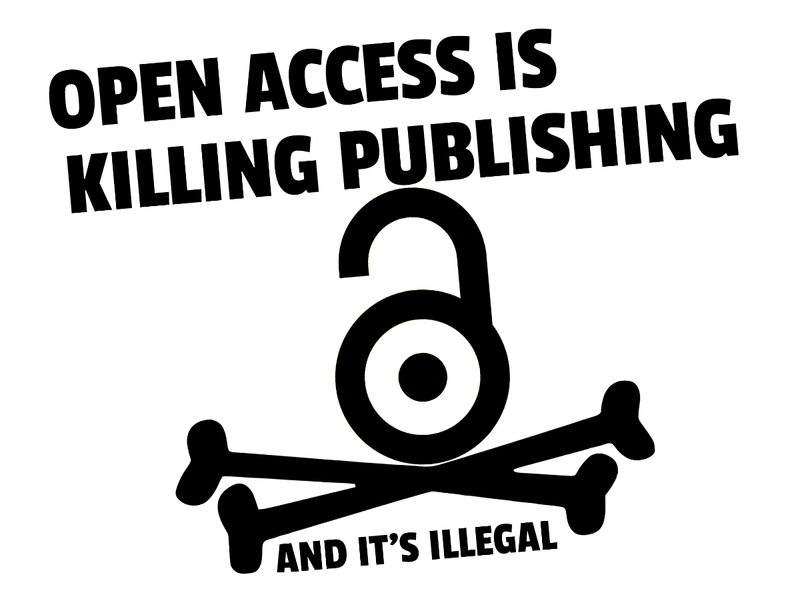 Open Access Is Killing Publishing…And It’s Illegal! Limited Copyright Is Killing Innovation…And It’s Illegal! The term OER does not take an ‘s’ in the plural. That is to say that the answer to the age-old question “OER or OERs?” is definitively the first and never the second. Moreover, one can create OER but not an OER; one can have OER but not one or more OER. How do we know this to be so? We do not. In my case, I have the estimable authority of my own opinion; I have a strong visceral reaction to hearing the term OERs spoken aloud and only a slightly more subdued reaction to seeing it in print. Often, it seems that OERs is used to describe actual learning objects, whereas OER will be used to describe the concept of OER. That is, OER can be a concrete or abstract noun, and OERs is the plural of the former sort. That could wash if such usage were very strictly consistent. That both versions are often used inconsistently in the same source suggests either that both are correct or either is correct; in such a case, however, good style dictates that we choose one. The (possibly) collaboratively-edited Creative Commons wiki page “What is OER?” includes just one use of OERs, in a quote directly from the Wikipedia article. A 2010 message by UNESCO’s own Assistant Director-General for Education uses OER and OERs nine times each, once using both in the same sentence. There is no easy way out of this mess. The preponderance of evidence seems to favor the authority of OER without clearly suppressing OERs. But if, by fiat, each creator can prefer one term to the other and is consistent in using one term over the other, at least we may hope that one will win out by overwhelming the other. You know my heart, and if I lose I will try to be gracious but will probably choose to be wrong. Some losing battles are worth fighting, after all. Image created using Text ASCII Art Generator by patorjk. More sweet software here.